Whew! My computer has been acting up. Thankfully, we have more than 1 computer in the house and a super techie sweetie for a husband. 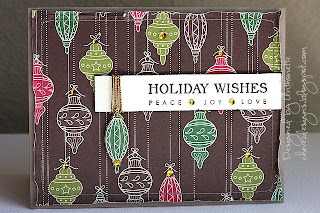 This card was submitted to Embellish Magazine's first publication call. I'm very happy for Ashley and Mac in their new endeavor. I love kraft cardstock! I didn't want to miss this challenge. I had to have Jen Allyson's digital cutting kit after seeing Kristina use it on her Finally Friday video. 1. 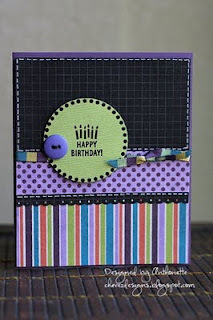 Trim kraft cardstock into an A2 card. 2. 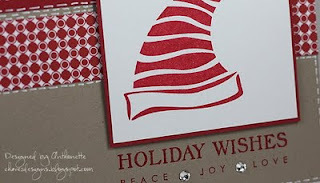 Use QuicKutz Silhouette to cut out card front and the welded word Thank You (cut word 3 times). 3. 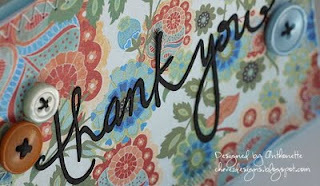 Glue 3 copies of Thank You together. 4. Use the gel pen to add faux stitching to the welded word. 5. 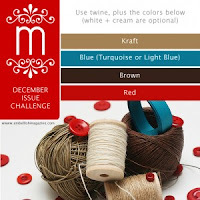 Wrap part of card front with twine. 6. Punch hole and add the chocolate chip brad. 7. Round corners of kraft cardstock. 8. Punch heart shapes 3 times out of kraft cardstock and glue together. 9. 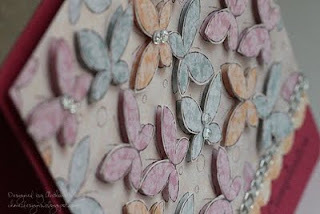 Punch heart shape from designer paper and glue to chipboard. 10. 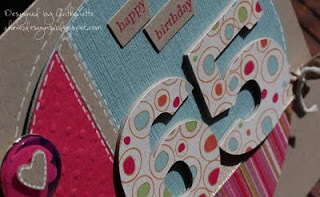 Use foam tape to adhere card front and welded word to card base. 11. Thread button with twine. 12. Adhere button and heart chipboard. Hope you're all having a great weekend. My sweet mom celebrated her 65th birthday yesterday. This is the card I made for her yesterday. I can't believe she's 65 years young! My mom is very active. She seems like she never sits down. Several times a week she goes for very long walks. A few weeks ago, she joined my sisters and brother-in-law for an extreme hike outside of Taos, NM. It was 16 miles round trip and it took 10 hours! She wanted to accomplish it before her 65th b-day. She did it! She has better knees than I do. I wouldn't be able to do this hike. 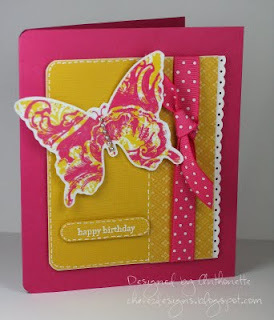 My design was inspired by this card created by Angie Tieman. I love all her designs! The faux stitching was inspired by the fabulous Kristina. 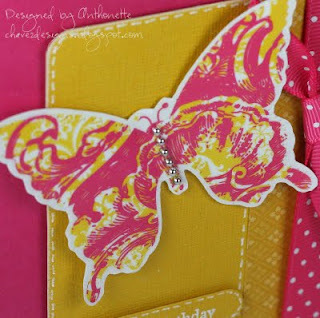 I used my QuicKutz Silhouette to make my own chipboard again. I created the 65 using the Rockwell Extra Bold font on my computer. I cut out the numbers several times from Kraft cardstock and glued the layers together. I also the Silhouette to cut the numbers out from some pretty Carolyn Gavin for K & Company paper (thanks, Ericka!). No craft knife or sanding block required! 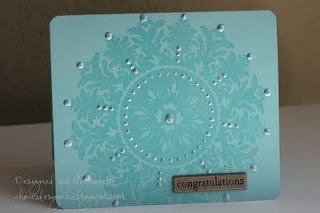 I used the Big Shot to emboss some dots onto Melon Mambo cardstock. 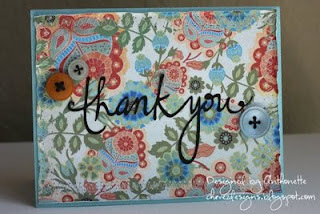 The brad-type embellishment is actually a clear button that I backed with some more Carolyn Gavin paper. On top of the button I added a kraft colored heart. I also did some faux stitching on the heart. Thanks for looking. Have a good one! Hi everyone! 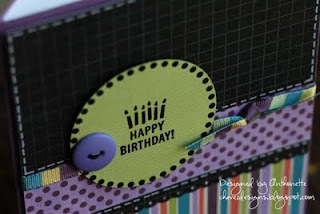 I wanted to show the versatility of the Jeepers Creepers Hybrid Printables from Sweet Shoppe Designs by making a non-Halloween birthday card from one of the card fronts. 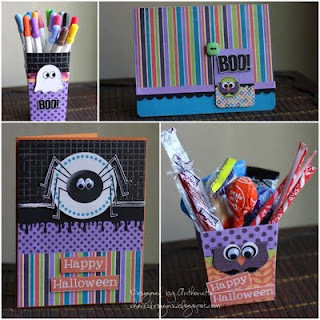 Yesterday I featured cards and popcorn cups made with this Jen Tapler & Libby Weifenbach kit. I trimmed one of the card fronts by using my EK Success border punch. I glued the scalloped border on the card front. I added ribbon. 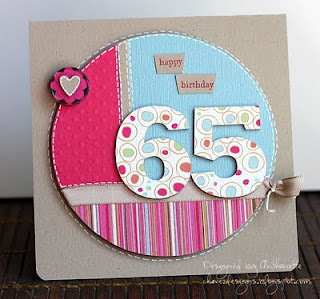 I used a masked off Happy Birthday stamp and stamped the sentiment on the dotted circle. I did some faux stitching to finish off the card. I threaded the button with a thin strip of the leftover cardstock. I'm SO proud of Jen Tapler! She teamed up with Libby Weifenbach to create an awesome pack of ready-to-print Halloween goodies called Jeepers Creepers Hybrid Printables from Sweet Shoppe Designs. She gave me an advanced copy. I had fun playing with the kit this weekend and today. The kit comes with 2 card fronts, 3 different tags, a cookie wrapper, tall popcorn cup, and a short popcorn cup. I just printed the PDFs and got to work. It was so easy! I messed up the printing a little bit; I was printing from the computer upstairs and my printer is downstairs. The papers came out of the printer too fast and the black ink was still a little moist. The projects piled up on each other and smeared the ink. I didn't reprint because I liked the distressed look it produced. I printed on a few different types of paper to see the difference. I have another project to show you tomorrow that is not Halloween. I wanted to show the versatility of this kit. I got to use my Gooey Goo punch from Martha Stewart. I finally found this punch at Michael's a few weeks ago. I wanted this punch last year, but could never find it. This card is actually a belated birthday card for my friend, Rosa Elena. I really like the Razzleberry Lemonade paper. This card uses the same colors as the card I made yesterday. 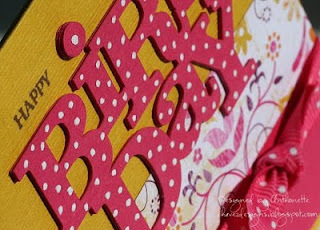 For this card, I made my own chipboard again with my QuicKutz Silhouette by cutting the word "birthday" 3 times from Melon Mambo cardstock and gluing the 3 layers together. 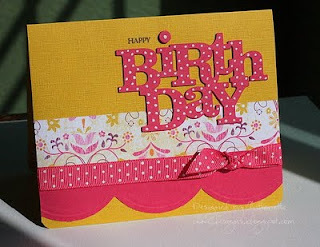 To repeat the pattern on the ribbon, I used my Sakura pen to add dots to the birthday chipboard. Today was one of my best friend's birthday. Cris is celebrating a major milestone birthday. This card is for her. She hasn't had a party since before September 11th, 2001. Her party was cancelled on that terrible day. I started working on the design yesterday, so it was a cool surprise to see the Clean & Simple Fall-to-Layout #59 today; it matched my layout! That's never happened to me. I love the layouts on Clean & Simple, but I usually don't have time to participate. I've been wanting to use some Hambly Studios goodies I picked up at their studio in early August. The clear butterfly sticker is from their collection. 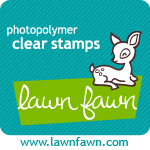 It matches very well to the new Stampin' Up In Colors. They opened their studio to the public during the Santa Clara Scrapbooking Expo. I loved visiting them! They were all so warm and friendly. To show you the power of Twitter, I posted a tweet that I was on my way to their studio. When I walked in, Allison Kreft Abad knew I had to be the woman who tweeted about being on her way. The office staff also knew. It was so fun seeing all their CHA release stuff. The office staff said I can order from their website and not pay shipping because I can just drive to their studio and pick it up. Lucky! I placed the clear sticker on white paper and trimmed it out. You can see the detail in the photo, but I paper-pierced around the edge of the butterfly. For some added interest, I rubbed white craft ink on the edge of the Crushed Curry cardstock and embossed it with white embossing powder. Happy Friday! This week was short, but a lot of things happened to me; good things and my most embarrassing moment of the year. Good News #1. When we returned from our long weekend in LA, I had an email from Robin Carlton, the owner of Sweet Shoppe Designs. She asked if I would like to be a Hybrid Babe. Of course I said yes! 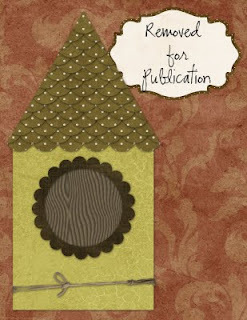 Sweet Shoppe Designs is a cool online store with the most delicious digi designs (paper packs, images, and brushes). I'm relatively new to the digi world, but I've been wanting to get into it more. 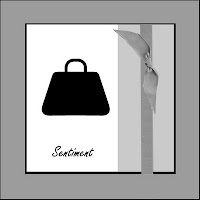 You won't see me all of sudden doing digi-scrapping layouts, but you will see me printing their papers and images and using them on my paper crafting designs. Jen Tapler is a Hybrid Babe for Sweet Shoppe Designs. I always love the designs she does. Because of Jen's suggestion, I'm on this team. Mahalo, Jen! I got the biggest shock this morning when I was registering on the Sweet Shoppe site, Robin announced that both myself and Heather (yes...THE Heather as in "pine is here.") were newest members of the team. I gasped when I saw Heather's name. I love all her work! Good News #2. I had to be at school super early this morning. Our local newspaper is doing a story about the Parent Volunteer Room we (the PTA) opened this year at my son's elementary school. We were meeting a reporter to talk about the new room. Parents can sign up to help on various projects to help out individual teachers (making copies, transparencies, binding booklets, etc.) or help in the library. In our room, we have a laminating machine, copier, and computer. We have a kid's corner with toys and a TV to keep our kid's occupied while we get some work done. We also have a refrigerator, coffee maker, toaster, and microwaves to make the room more welcoming. We have an area where we can sell school t-shirts, pencils, notebooks, and folders, as well as SCRIP (gift cards that earn money for the school). I'm very proud of the work we are doing. Embarrassing Moment of the Year. On Wednesday, I triggered the fire alarm at school! I was trying to get to the PTA closet, which is next to the stage in our multi-purpose room. The room was pitch dark, so I went in feeling for the light switch. I did think to myself "this is a weird feeling switch, but it is a very huge room so maybe it has a very large switch". Duh! I pressed it and BAM lights were flashing and the noise was very loud. I tried to turn off the "switch", but it was the fire alarm. I rushed to the office, but I could already see teachers leading their students outside. I met up with the principal and confessed my that it was my fault. He and the staff were very nice about it. I emptied a school of almost 700 people in about a minute flat! I was sweating and red for at least an hour after that. I can laugh now, but I was mortified when it happened. It qualified as their September fire drill, so they don't need to have one for the rest of the month. The Little Guy is sick today. I was up before 1 AM with him since he had a bad sore throat and a weird cough. This morning when I got back from school, I noticed he had a fever. He's currently resting and watching a show. Those of you who follow my blog are probably shocked to see me post so many blog entries in one day. I'm shocked too. This is the last one, dearies! Last one for the day. 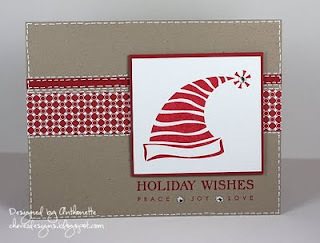 This card is for Cath's Moxie Fab Stretch Your Holiday Style With a Stamping Challenge. I CASEd my Christmas card from last year. I added a lot of faux stitching. Kristina has me addicted to faux stitching! I love the detail it adds. 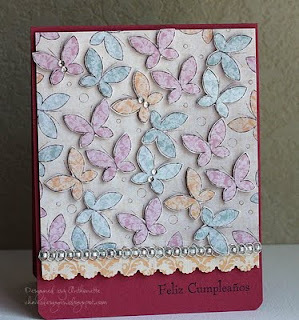 Here's a second card for Cath's Moxie Fab Classy & Elegant Challenge. I started this card last week. I've been obsessed with the SU! Medallion stamp. Here's one more use for it. 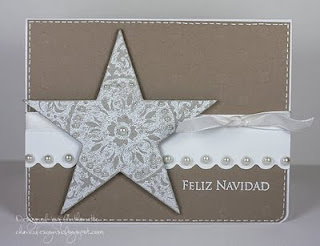 I took a large star chipboard piece and stamped the Medallion stamp on it. I embossed it with white embossing powder. I love how it looks. It felt "Christmas-y" to me, so I decided to post it on Cath's challenge. I added small pearls to the star and continued with additional larger pearls. 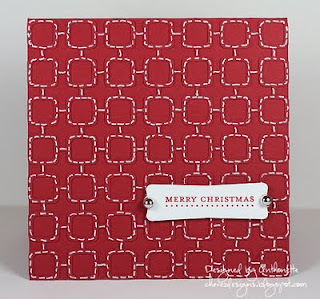 I used my Big Shot to emboss large dots with a Texturz plate. I used this SU! sentiment last year on my Christmas cards. I love the sentiments of Peace, Joy, & Love. This card is for Cath's Moxie Fab Classy & Elegant challenge. I did some sewing on this card. I distressed the edges with my finger nails. I popped up one of the ornaments and hung it from my sentiment. I added bling to the card and I was done. We're back from a long weekend and I'm rushing to get my challenge cards posted for Cath's Moxie Fab Clean and Graphic Challenge. I love when I see clean and graphic designs! Here's my attempt. This card is 4.25"x4.25". I used my QuicKutz Silhouette to cut out the mod type of background. I used my gel pen to faux stitch the entire design. The long weekend (Labor Day weekend in the US) is almost here. What do you have planned? We are driving down to the Los Angeles area to visit my in-laws and celebrate my mother-in-law's birthday. So much to do before then! Here's another card using the Medallion stamp. 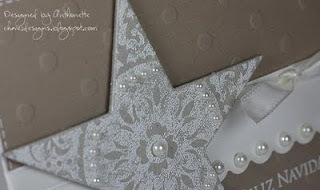 I loved how Kristina used Perfect Pearls on this stamp. This card is ultra-simple; no layers! I stamped and embossed the image. Added Perfect Pearls and tapped the back-side of the cardstock to get the Perfect Pearls to form a nice dome shape. I added an older medal embellishment from my stash and I was done. Thanks for stopping by! Happy Wednesday! I completed another card I started last week. This card is for my mother-in-law. She's celebrating her birthday this weekend. This is a hybrid card. 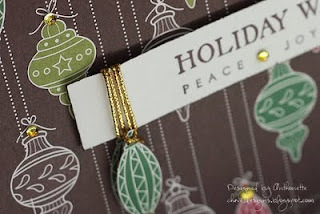 The patterned paper is more digi-paper I won from Holly Jones. The pack is called Delicious Lemonade. I always love butterflies. I started out popping up just a few butterflies on foam tape, but I decided to go all out, since I had printed a wide strip of the digi-paper. I updated my blog header for the first time since starting this blog 18 months ago. It was time for a very small face lift! I'm relatively inexperienced using Photoshop Elements, but I was able to create the header. I used a picture I took in my parent's backyard in New Mexico. My parents always have beautiful flowers; I guess I didn't inherit their green thumbs. I had some time today to finish up several cards. I've had this BasicGrey Marrakech paper sewn to this card base for over a month! This card base even went to New Mexico on vacation with me. 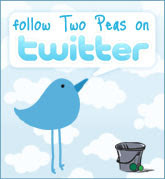 I couldn't settle on a design for the card. Well, this week I've been playing with some new welded words I downloaded from QuicKutz. 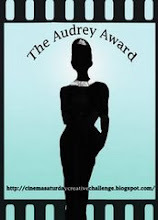 Every time I use my QuicKutz Silhouette I'm so thankful to Hero Arts & QuicKutz for the prize. I still can't believe I won the machine. My Sakura Quickie Glue pen sure came in handy for gluing down this die cut. Do you have this pen? If not, you should get it. I threaded the buttons with thin strips of black cardstock.